You always hear the stories about how someone buys a painting or, say, negatives from a garage sale for five dollars and it turns out to be a long-lost Cézanne. But how often does that happen, right? It happens all right, and you can improve your odds of such discoveries by having expensive tastes and keeping your eyes open. Two Fridays ago I was at the Dover farm of the Delaware Supreme Court Chief Justice. Chief Justice Myron T. Steele was kind enough to open his home (and extensive lands) to legal interns, clerks, and staff–past and present–for a barbecue. There were fireflies, barking dogs, frisky ponies, and the good smell of roasting chicken and ribs: there was magic in the air. There was also a big tub of beer and wine on the lawn. It had nothing too fancy–mostly Bud Lite and Yuengling on the beer side, with some standard-issue Pinot Grigio and Chardonnay on the wine side–but who cared? It was perfect, lazy evening weather, and the conversation was good. I was also very thirsty, so I returned time and time again to the tub to get fresh beers. On one such trip I rummaged around the ice and saw a bottle of white wine I had not previously noticed. It was a gorgeous honey-amber color. My first thought was that it was a Spanish wine of some sort–I’ve had some good Verdejo that came in bottles that color. But this wine wasn’t in a colored bottle: the bottle was clear. I reached into the tub and turned the wine around, then audibly gasped. I could recognize that label from anywhere. What the hell was this bottle of 1987 Chateau d’Yquem doing in a tub of Bud Lite?! “Well, because it’s a very NICE bottle of wine,” I replied. I wasn’t quite sure if the Chief Justice was being very generous or didn’t know the provenance of the particular bottle I was holding, but I didn’t ask anymore questions. I eagerly opened the bottle and poured the Yquem around my table. I wanted to punch them. 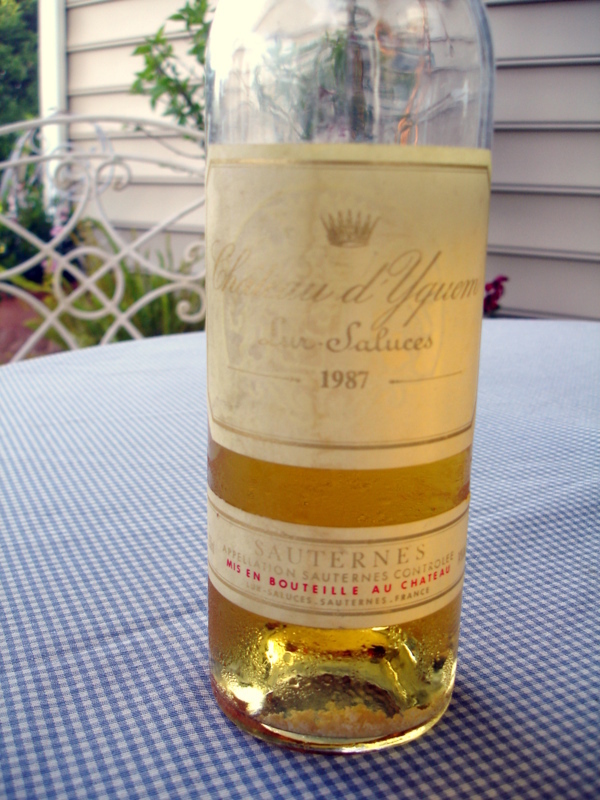 Chateau d’Yquem is the only Premier Cru Supérieur (“Great First Growth”) in the Sauternes region of Bordeaux. Its wines are composed of Sémillon and Sauvignon Blanc–but then again, so are many other of the white wines of Sauternes. What makes Yquem so special is that its vineyards are especially well situated to be affected by the right proportions of Botrytis cinerea, or Noble Rot. This fungus is usually a plague on plants–grape vines included–but in certain circumstances Botrytis doesn’t destroy the grapes but rather enhances them by creating microscopic holes in the grapes that allow water to evaporate, concentrating the sugar within the grapes. Many of the great sweet wines are similarly affected by Noble Rot, including the Tokaji wines of Hungary. However, Yquem is hands-down acknowledged to be the best sweet white wine in the world and is priced accordingly (always going for at least a few hundred up to over a thousand dollars a pop). And I found a bottle of it in a tub of domestic swill. How was it? Well, on the nose it was very concentrated honey and baked pear or apple. It was fantastically sweet, but with a good streak of acidity keeping it from being cloying. The best thing about the Yquem was its mouthfeel: just absolutely gorgeous and tongue-coating. Think of the essence of nectarines, apples, pineapples squeezed and mixed into honey, with just a hint of wet newspaper (not a bad thing). Think, too, of a lingering finish lasting for minutes. But truth be told, it wasn’t a transcendent experience. It wasn’t what I thought an Yquem should be. At the end of the night, however, half the bottle was left, and I took it home. (What if they threw the rest out?) I brought the bottle to MacArthur Beverages, where I poured some for Phil and Phil’s boss. Phil’s boss saw the label and instantly declared that 1987 wasn’t a strong vintage for Sauternes; he drank and said that while this was good that it did not compare with the greatest Yquems. Robert Parker agreed: he gave the ’87 a score of 88–a far cry from the high 90s and occasional perfect 100s that Chateau d’Yquem wines garnered. I was glad to have my thoughts confirmed, but also glad to discover that the 1987 was still retailing for $300 a bottle. I wouldn’t have bought it for that price (nor could I afford to), but I was certainly glad to have discovered it there on a farm in Delaware. So let this be a lesson: read all you can about wine, and pay attention to those big names that you might not think you’ll ever be able to drink, because who knows? You might find a bottle of Pétrus at your next company outing. That is awesome. The really crazy thing to me is that we had an econ assignment in my MBA prgram based on this exact noble rot scenario. I, being not particularly well educated in this area thought it was made up. Perhaps I gave too little weight to the potential in my decision tree analysis. Fantastic story! Somehow I don’t think I’ll be finding any Petrus lying around my office, but I’ll keep my eyes open :). Strangely I randomly had a chance to taste D’Yquem recently too. a 1995 – was like liquid saffron.